The Final Four is happening this weekend. And by Final Four, we of course mean the intense battle between Mulan and Monsters Inc; Rapunzel and Remy. A Disney versus Pixar battle is the latest March Madness spinoff to hit offices across the country. Inside Out over Finding Nemo!? No chance. Not even an UMBC over Virginia chance. Some people are endlessly discussing the seeding of the match-ups while others seem to be having a Disney-inspired existential crisis. 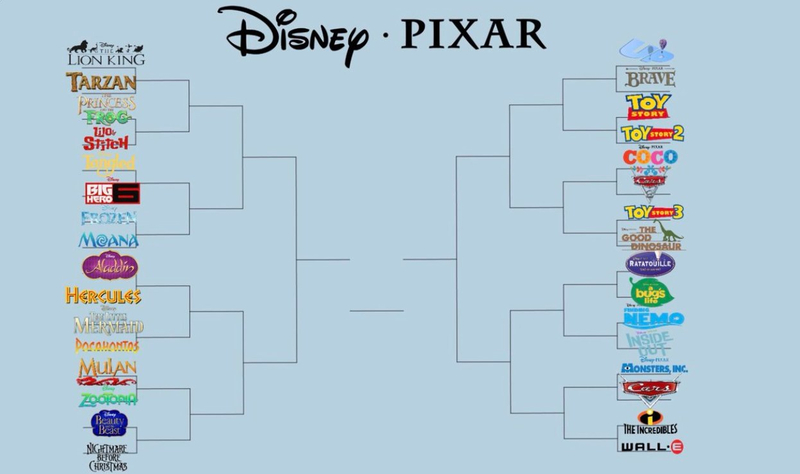 There are now numerous iterations of the Disney/Pixar bracket but the most popular by far is by a Twitter user named Jolley Rancher who, curiously, picked "Tangled" over "The Lion King" in his own bracket. I mean, that's obviously wrong. Or is it? Go ahead and print out the blank PDF bracket here and stir up some Disney/Pixar magic (disagreements?) in your own office.